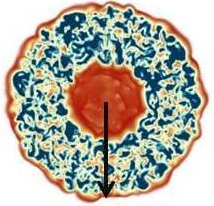 Plasmas under strong compression, as existing in inertial confinement fusion capsules, experience a tremendous growth of their viscosity coefficient due to the temperature increase. It is known that this implies a fast decay of turbulence intensity. By studying this problem using both direct numerical simulations and spectral turbulence models, the authors show that this sudden dissipation effect is also accompanied with a sudden diffusion effect possibly enhancing mixing and sensitivity to initial conditions in these devices.